So you’re building a liquid cooling system for your PC and need to select the right radiator fans for the job. All anyone wants from a radiator fan is sufficient cooling power and as little noise as possible. However, there are a few more factors to consider than just airflow and decibel ratings. For those not well versed in fan aerodynamics, comparing the specifications of radiator fans can be confusing. But fear not – help is at hand. We’ll discuss the different types of radiator fans and how they are suited to various radiators and liquid cooling set-ups. We’ll also review the best radiator fans on the market, aiming to cover a fan for every need. For the uninitiated, the airflow of a fan (i.e., the volume of air the fan can move over a unit of time) may appear to be the only relevant factor in cooling power. This assessment would be correct in environments without airflow impedance in-front or behind the fan (such as for a regular desk fan). However, when impedance exists (such as radiator fins or dust filters), this will cause some air to be deflected away, reducing efficiency. This is where static pressure comes in. Static pressure refers to the force with which air is expelled from the fan and thus its ability to overcome obstacles. An analogy is that the horsepower of a car engine is the most important factor in determining maximum speed on a flat tarmac road, but torque becomes more significant when going up-hill or off-road. Like with torque, the force of static pressure helps to overcome obstacles. Static pressure is measured in either Pascals or millimeters, water gauge (Pa or mm/H₂O, respectively). Most fan specs use mm/H₂O so we will use this measure also. There are four important specifications to look out for in a radiator fan. When choosing radiators and radiator fans, you should first consider how many components you need to cool and how many radiators you can fit in your case. Rule of thumb: you should create 240mm of fan space per main-component that needs cooling (main components being things like CPU and GPU, not RAM). After two components you may add 120mm of fan space per component. Having more radiators and more radiator fans allows for a lower number of fins per inch (FPI) on each radiator and lower fan speeds (less noise). Cooling radiator fins (usually made of aluminum) is the active mechanism for dissipating heat from the radiator. The greater the FPI, the greater the surface area for cooling. High FPI designs cause greater airflow impedance, meaning that higher static pressure from the fans is required to penetrate the fins. A side-effect of this system is greater noise caused by higher RPM fans and air hitting the fins. As one of the primary benefits of liquid cooling is lower noise, it is recommended to have as many radiators (each with a low-FPI) as you can fit in your case. This set-up allows your fans to operate at a lower RPM, generating less noise. If you can only fit one radiator in your case, a higher FPI radiator with high static pressure and CFM fans should be used. An FPI of 7-11 is considered low whereas 20+ is considered high. Radiator thickness is similar in principle to FPI in that higher thickness requires higher pressure to push air to the back of the radiator. Airflow is an important measure for thick radiators, as it increases the volume of cool air that reaches the back of the radiator. Thick radiators with low FPI may operate better with airflow-optimized fans. An advantage of thick radiators is that they operate well at a range of RPMs, whereas thin radiators usually operate most efficiently at specific RPMs. A thickness of around 35mm is considered low whereas 50mm is considered high. Note: when considering the static pressure of your fan you should also include other impedances such as other grills and dust filters in your calculation. Radiator fans connect to the motherboard via either a 3-pin or 4-pin (PWM) header. What is the difference? 3-pin connections allow for fan speed to be altered by the supplied voltage using fan speed software. 4-pin (PWM) connections allow for pulse width modulation signaling—this gives finer control to fan speed based on temperature and prevents stop-starting. If your motherboard has 4-pin headers available, then 4-pin radiator fans are recommended (especially if you are using 3+ fans that typically run at a mid-low RPM). PWM signaling will increase fan efficiency and reduce noise output. Note: If you run a 3-pin fan in a 4-pin header or a 4-pin fan in a 3-pin header, in both cases, it will act as a 3-pin fan. As most radiators have a square panel design, you may be able to increase efficiency by using radiator fans with square frames. A square frame can provide a tighter fit to the edge of your radiator, preventing air from leaking out the corners. Most static pressure fans have a square frame. The correct method of mounting radiator fans is a hotly debated topic. The current consensus is that all things considered, push and pull mounted fans deliver a similar performance. A push-pull set-up is where push fans are mounted on one side of the radiator and pull fans on the other. Though this doesn’t improve airflow, it will increase static pressure, giving a ~130% performance compared with a single layer of fans. As modern fans are well equipped for delivering excellent static pressure, a push-pull set-up is usually unnecessary. We recommend mounting your radiator fans in the pull direction as it allows for easier dust removal (either by hand or with a vacuum). When air is pulled through the radiator, dust collects on the exposed opposite facing grill, making it more easily accessible. When mounted in the push direction dust collects behind the fan, meaning you’ll have to unscrew the fan to access the dust. In this section, we’ll take a look our picks for the 10 best radiator fans on the market and describe what kind of set-ups they are suited for. Top 5 120mm radiator fans - The specifications displayed above relate to the maximal output of each fan. Top 5 140mm radiator fans - The specifications displayed above relate to the maximal output of each fan. Single radiator set-ups really push the limits of required cooling power for most PCs. Luckily, radiator fans have become much more advanced in recent years, with many models achieving high static pressure and airflow without sounding like a jet engine. Note: We do not recommend a single radiator set-up if you are cooling more than two main components. One advantage this fan has is that, due to various optimizations of blade shape and motor design, it can operate at high performance with very low power consumption. The ML140, part of Corsair’s magnetic levitation range, showcases the latest in computer fan technology. Though many will be drawn to this fan for the elegance of its design, the performance advantages of magnetic levitation make it far more than just ornament. By reducing contact between moving parts, speed loss via friction is reduced, noise output is reduced, and lifespan is increased. There is a similar 120mm model available by Corsair. Two radiators accommodate for around 5-6 fan units and considerable improvements in active cooling. Depending upon the number of components you need to cool, you may be able to reduce the FPI and thickness of your radiators, allowing for lower RPM fans. Note: We do not recommend a double radiator set-up if you are cooling more than 4 main components. Noctua fans are probably the most commonly recommended fans around and receive considerable praise online for their immense power and unnatural quietness. Generating airflow of 93.4 CFM while only producing 22.4 dBA of sound, they have the best claimed performance-noise ratio of any fan we reviewed (isn’t that everything you want from a fan?). The only drawback that some users observe is that their design is not aesthetically suited to many cases. Noctua also provides a similar but slightly less powerful 140mm option in the Noctua NF-A14. 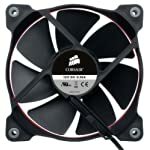 The SP120 by Corsair differs from the Noctua NF-F12 in that it prioritizes static pressure over air flow. If you have several components to cool and thus require high FPI radiators the SP120 may have some performance advantages over the Noctua NF-F12 model. However, if you have a medium FPI and high thickness you may find the Noctua outperforms the SP120 due to superior air flow. Additionally, the Noctua considerably less loud than the Corsair model. 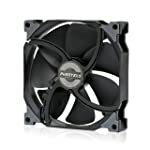 This model is part of Thermaltake’s “Ring” range of radiator fans. These fans are equipped with a ring of LED lights that run along the inside edge of the frame. Though they may not be the most powerful radiator fans on the market, they are certainly some of the best looking. If you are planning a three or more radiator set-up, you can consider using some less powerful but cheaper fans. One disadvantage of less powerful fans is that they often do not have a 4-pin connector. For this reason, many 3+ radiator set-ups use mid-range fans (as described in the two radiator set-ups section). Though they cost more, they will offer better efficiency, sound reduction, and cooling power. The Corsair Air Series SP120 is a highly economical option with well-balanced specs suited to many set-ups. 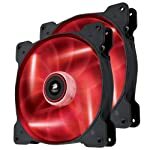 They come in twin-packs and have been some of the most popular low-end radiator fans in recent years. Several color options are offered for the LED lighting, and a two-year warranty is also included. The Corsair Air Series SP140 offers very similar specifications to the SP120. It also offers the same LED lighting color options and 2-year warranty. The Phanteks PH-F140MP-1z is an ideal PWM option for a three or more radiator set-up. They are highly affordable and have excellent specifications given the price point. The main feature that reviewers of these fans comment on is how quiet they are. They are apparently virtually inaudible at low RPM, making them ideally suited for 3+ radiator set-ups. You should now be well equipped to choose the best radiator fan for your PC’s liquid cooling system. Our picks were based on user experience as well as raw specifications as manufacturers may not be accurate in their estimations of radiator fan specifications. This is especially relevant when it comes to noise output. It is always important to read customer reviews to get an idea of other people’s experiences. If you are still unsure about anything, feel free to leave a comment below, and we’ll be happy to answer any questions. I have Corsair Air Series SP120 on front panel as intake fan and i am really satisfied with it. You did not include the NOCTUA NF-A14 INDUSTRIALPPC-2000 140MM PWM with a static pressure of 4.18 mm H2O.